Grosso Lavender is probably the most planted and cultivated lavender in the world. It is used mainly in the production of oil used cosmetically. Notice the very dusty soil all around the plants. This photo was taken on a day the temperature reached over 100 degrees. And, while these plants receive water every day during a scorcher like that, the ground drains very fast and the soil bakes dry quickly---just the way the lavender likes it. This Grosso Lavender is about five years old and four feet across with its bloom. It looks a little lopsided because it is watered with an overhead sprinkler that displaces the blooms. A drip system would give a more uniform "ball" look to the plant. Planting close together makes a nice hedge and can be good for commercial crops where land is valuable, but blooms will be sacrificed as it crowds up against its neighbor. Pruning hard into the gray leaves will reward you with a magnificent blooming bush that radiates more than three feet in all directions. Just make sure to prune after it blooms in the summer or fall and not in the spring! This view from above shows just how long the flower wands get. The plant is way down there. The flower stems are a bright green but the plant is gray which makes the effect of the whole plant even more stunning. It is very important to prune either after bloom in late summer or very early in spring just as the plants starts to perk up. If your late summer is very hot, put off pruning until the weather cools off to about 80. 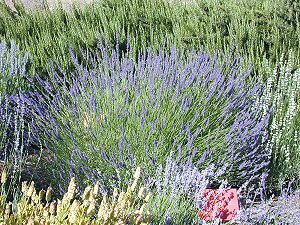 Lavender leaves release oils on hot days which cool the plant off. This is especially important for plants grown with minimal water. Cutting too many of its leaves off stresses the plant under this situation. In another spot this Grosso Lavender sets off a Rosemary Hedge. Notice the small light flowered Lavender in front. 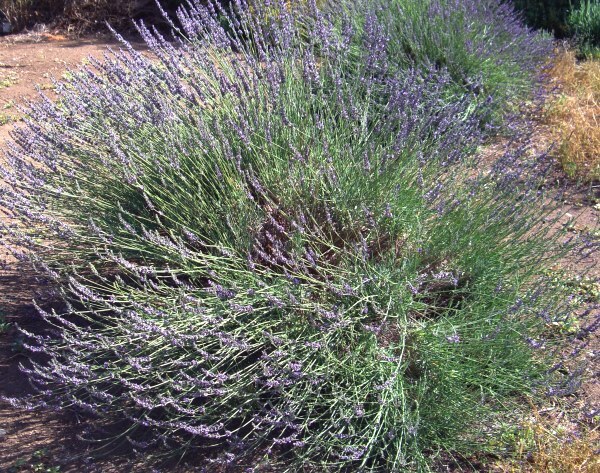 This is Lavender Vera, one of the most highly prized medicinal Lavenders. Just next to the Lavender Vera are some dried Yellow Lavender flower heads. These will be saved and collected for seed. 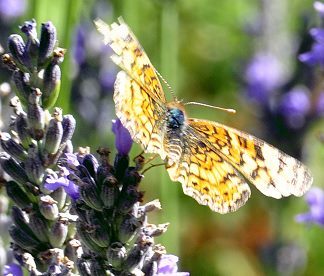 Lavender is very important for pollinators. It is a nectar source for butterflies and honeybees. Many other beneficial insects also benefit from lavender blooms. All of our Mother plants, like the Grosso Lavender above, start life as one of our three- inch ready-to-go pots (pictured on the left). 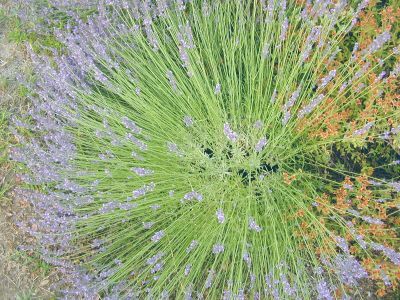 Grosso Lavenders should be planted three feet apart. Even here where summers can be brutally hot, they can be planted in the full sun. Be sure to provide adequate moisture for a splendid show! This plant is often available in plug trays. These trays hold 128 of all the same plant. They are a great low cost way to fill a lot of space. Each cell is 3/4 of inch by an inch. Check here to see if Grosso Lavender Plug Trays are available. Combine the ingredients in a glass jar and close with a lid for a week. Shake daily. Remove the herbs and Enjoy! 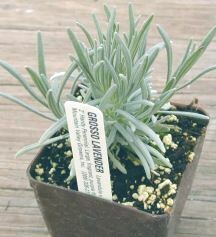 Grosso Lavender is one of the six plants chosen to be in our Zone 5-11 Fragrant Herb Garden.